Background: Female pattern hair loss (FPHL) is a very common problem in women. The underlying pathophysiology remains unclear, and there are no universally agreed treatment guidelines. Objective: We explored the clinical features, relevant medical and family history, laboratory evaluation, and treatment and compliance of 210 patients with FPHL. Methods: Data analysis from case notes was performed on 210 patients with a diagnosis of FPHL seen from January 2011 to December 2011. Results: The youngest individual was 8 years old and the oldest was 86 years old. 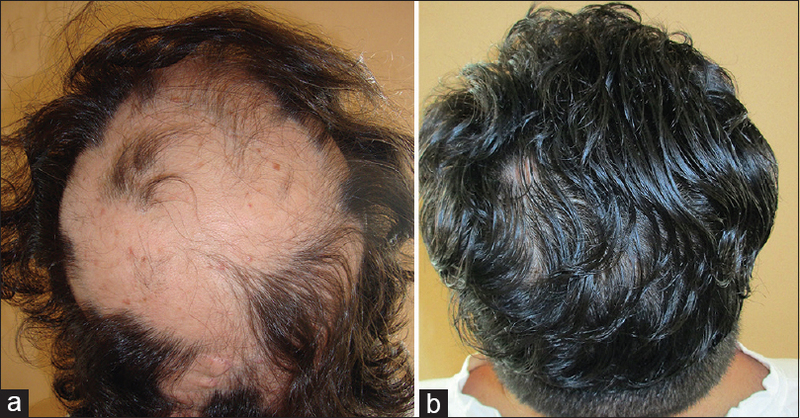 Nearly, 85% of the patients had a family history of androgenetic alopecia. Hypothyroidism and hypertension are the most common medical problems. Telogen effluvium (TE) is the most common concurrent hair loss condition. Only 38% of the patients were found to have normal Vitamin D level, 71% had ferritin level above 30 μg/L, and 85% had normal zinc level at the first consultation. Fifty-nine percent of the patients failed to attend any follow-up appointments. Limitations: One of the limitations of this study is its retrospective nature. Moreover, the severity of FPHL in terms of Ludwig score was not routinely documented in the medical charts. Conclusion: History of TE, hypothyroidism and hypertension, and low serum Vitamin D is common in our patients with FPHL. Introduction: Androgenetic alopecia (AGA) is characterized by miniaturization of the hair follicle, leading to vellus transformation of the terminal hair follicle. It is caused by interactions between androgens, several genes, and environmental factors with hair follicles. Benign prostatic hyperplasia (BPH) is highly prevalent among elderly men but infrequent in those younger than 40 years. Because both entities share a common pathogenesis and AGA manifests before the onset of BPH, there could be an association between AGA and BPH. Aim: To study the possible association between AGA and the size of prostate. Materials and Methods: Sixty-five consecutive male patients, 35–65 years of age with AGA of Hamilton–Norwood classification Grades 3–7, were included in the study. AGA of Grades 1 and 2 patients on treatment with minoxidil, finasteride, or other treatments for AGA with history of prostate cancer or prostate disease were excluded from the study. Prostate size was measured through transabdominal ultrasonography. Statistical analysis was done with SPSS software. Results: Of the 65 AGA patients, the mean age was 47.18 years. Grade 4 AGA was the most common grade seen in 19 patients (29.2%), out of which, most (47.4%) were in the 56–65 years age group. 52.3% patients had normal prostate volume, and 47.7% had an enlarged prostate. The percentage of patients with the normal and enlarged prostate in moderate Grade 3 AGA was 68.8% and 31.2%, and in severe Grade 6 AGA, it was 33.3% and 66.7%, respectively. Prostate enlargement was more likely to occur in severe AGA than in moderate AGA(odds ratio 3.311; P = 0.025, which is significant). Conclusion: This study revealed an increase in prostate size with increasing age, with higher prevalence of Grade 1 prostate enlargement in younger individuals, and with higher prevalence of Grade 3 prostate enlargement in elderly men. The study also found a positive correlation between AGA and prostate size, with higher grades of AGA having higher prostate volume. Context: Vitiligo surgeries have come a long way from tissue grafts to cultured and non cultured cell transplantation. Extracted hair follicle outer root sheath cell transplantation (EHF ORS) suspension is more enriched with melanocyte. In a hair bulb, there is one melanocyte for every five keratinocytes which is much higher than the epidermal melanin unit. Aims: To analyse the effectiveness of cultured EHF ORS and to perform objective evaluation based on clinical improvement & photographic evidence. To observe any untoward events or side effects. Settings and Design: The study was open and uncontrolled. All the patients were screened at preliminary visit. Reviews were done every two weeks. The endpoint selected was six months post procedure. 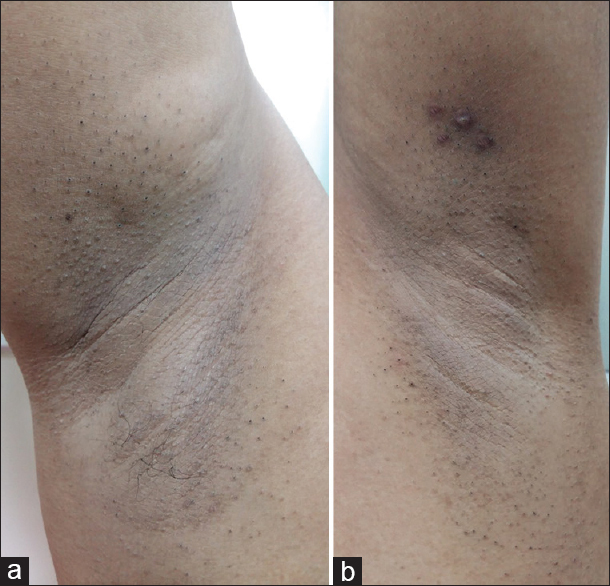 Materials and Methods: Twenty five patients of stable Vitiligo were included in the study and follicular unit were harvested by Follicular Unit Extraction method. 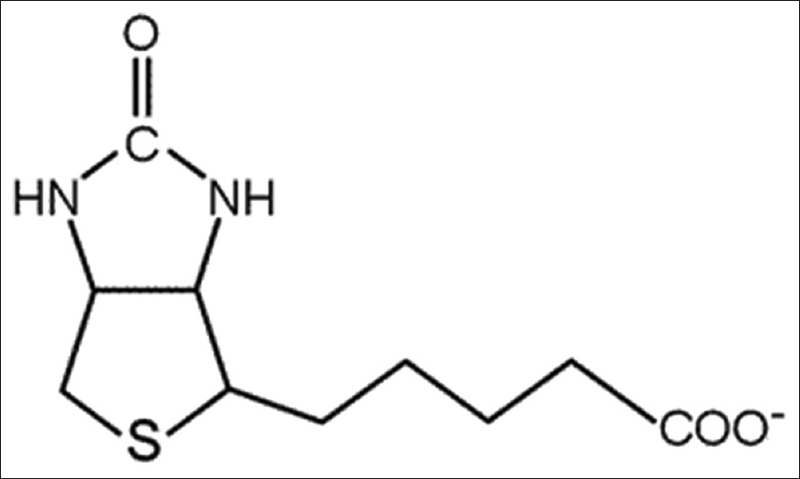 Outer root sheath cells were extracted by trypsinization. The solution was transplanted over dermabraded recipient site. Pressure dressing was given. Patients were followed up regularly. Statistical Analysis Used: Descriptive Statistics, Chi-Square. Results: Mean ± SD repigmentation was 80.15% ± 22.9% with excellent repigmentation (90-100%) in 60% of patients. Conclusions: This method is safe, effective, and simpler than the other methods involving cell culturing and requiring a laboratory set-up but selection of patients is crucial for the success of the outcome. 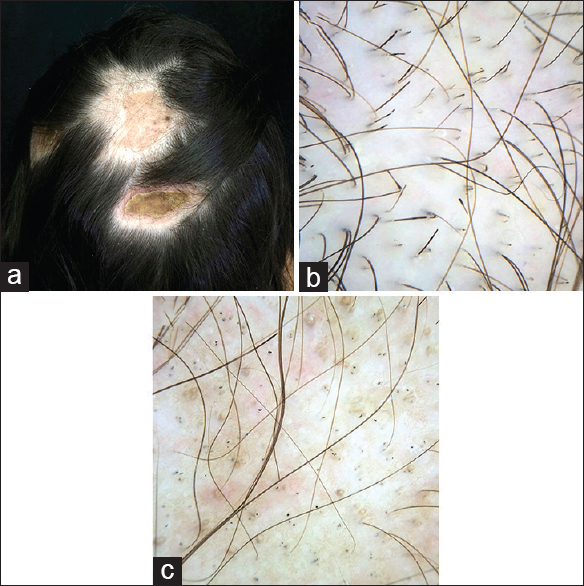 Trichostasis spinulosa (TS) is very common yet unrecognized disorder of the hair follicle. Usually occurring on the mid-face, especially on the nose, TS occurs more commonly in young, adult dark skinned women. 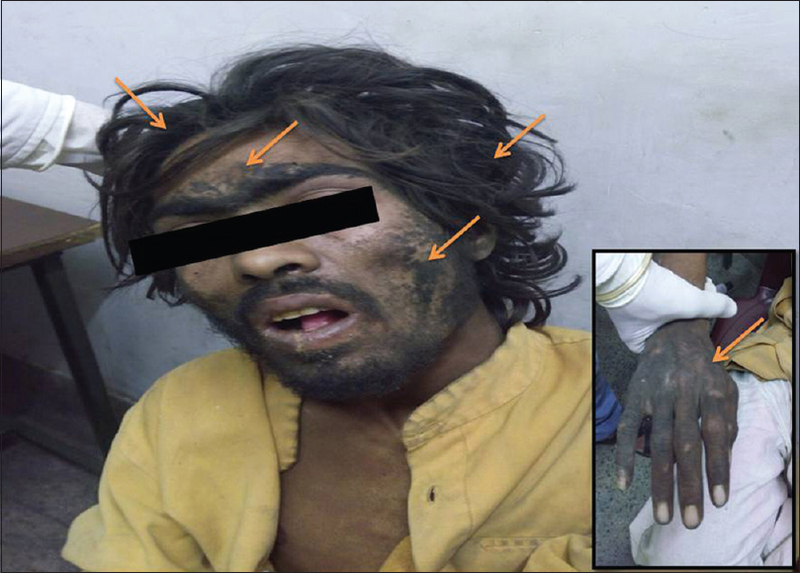 Here, we present a case of TS at an unusual site diagnosed on the basis of history, hair mount, dermoscopy, and histopathology. Ambras syndrome is a rare and special form of congenital hypertrichosis, characterized by dysmorphic facial features and familial pattern of inheritance. It is rarely associated with gingival hyperplasia. We report such a rare entity in a 38-year-old female patient with a history of consanguinity and positive family history. Hypertrichosis is characterized by increased hair growth independent of androgen excess. There are various causes of acquired localized hypertrichosis including chronic irritation and inflammation. 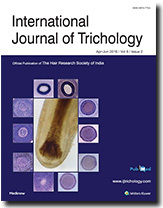 Localised hypertrichosis following pentavalent vaccine has not been described previously in Indian literature. We hereby report a case of a 4-month-old healthy infant presenting with focal circumscribed areas of hypertrichosis over anterolateral aspect of bilateral thighs at the site of vaccination. Vitiligo is an acquired, idiopathic depigmentary disease resisting satisfactory repigmentation despite multimodal therapy. Based on the concept of activation of the existing undifferentiated stem cells in the outer root sheet of the hair follicles, follicular unit extraction (FUE) transplant is an interesting advancement in the field of minimally invasive surgery for vitiligo. 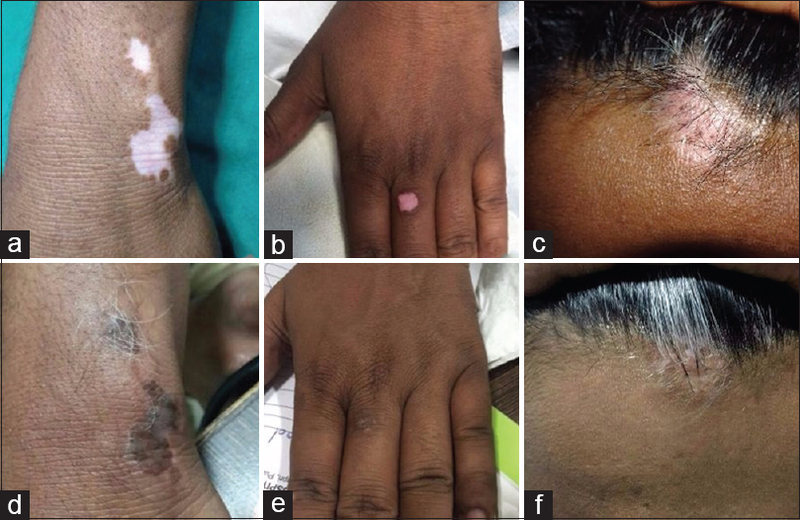 We herein present three cases of vitiligo whose residual recalcitrant foci as well as poliosis – refractory to therapy including with previous nonculture melanocyte-keratinocyte transplant – repigmented satisfactorily after FUE transplant. 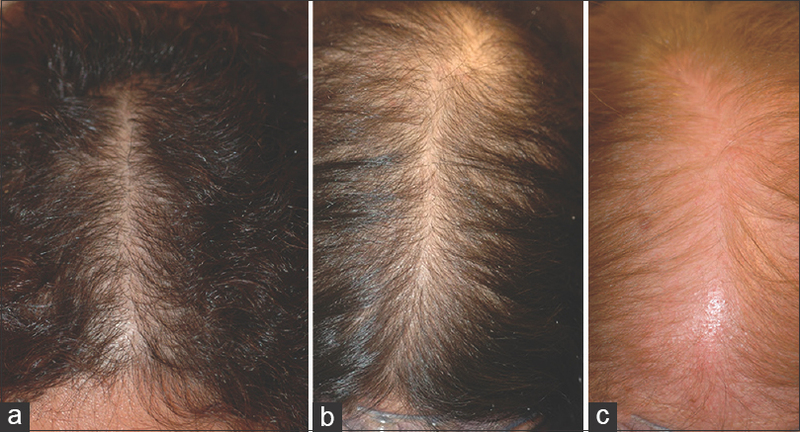 Pressure-induced alopecia is an unusual cause of hair loss, and reports of its trichoscopic features are scarce. 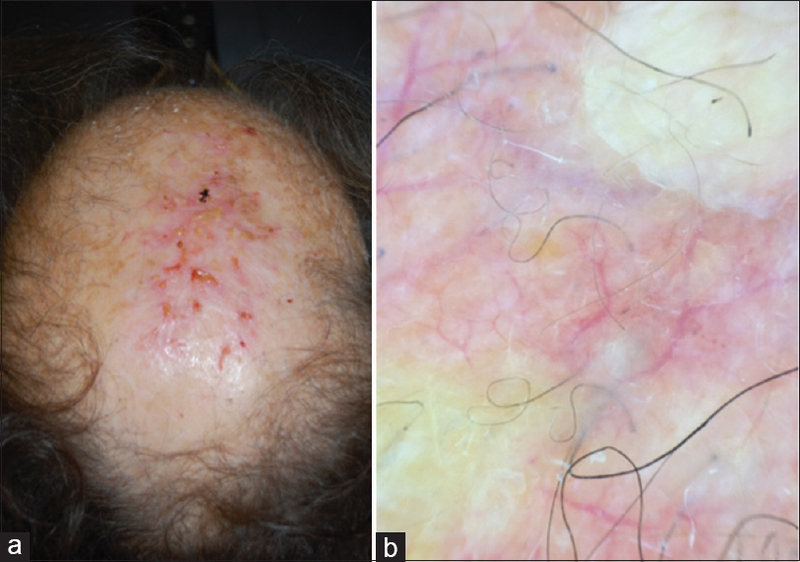 In this paper, we describe a case of pressure-induced alopecia in which trichoscopic and histopathological findings overlap with those described for alopecia areata. Erosive pustular dermatitis of the scalp (EPDS) typically affects elderly people with scarring alopecia. Videodermoscopy (VD) of the scalp has never been assessed in the diagnosis of EPDS. To evaluate the trichoscopy features of EPDS, we carried out a retrospective analysis of VD images obtained in the scalp of ten patients who affected by EPDS and were compared with those obtained from a series of thirty patients who affected by other type of scarring alopecia. The most specific VD feature was thus represented by evident hair bulb in the scarring scalp, observed in all patients. Introduction and Background: Cosmetic procedures for hair, such as bleaching, dyeing, and straightening, are commonly used around the world. It has been suggested that excessive use of such procedures can cause damage to the hair shaft. We aimed to assess hair shaft changes using scanning electron microscopy (SEM) in female volunteers who frequently use hair treatment procedures such as bleaching, dyeing, or straightening. Methods: A cross-sectional, controlled study in a sample of 25 female volunteers (19 study group and 6 controls) in the age group of 18–45 years. The study group was composed of volunteers who regularly used different cosmetic hair treatment procedures such as bleaching, dyeing, and straightening (any one of these or a combination). The control group had never used any specific hair treatment procedure. The hair shaft damage as seen on SEM was assessed using a standardized scoring system and compared among the two groups statistically. 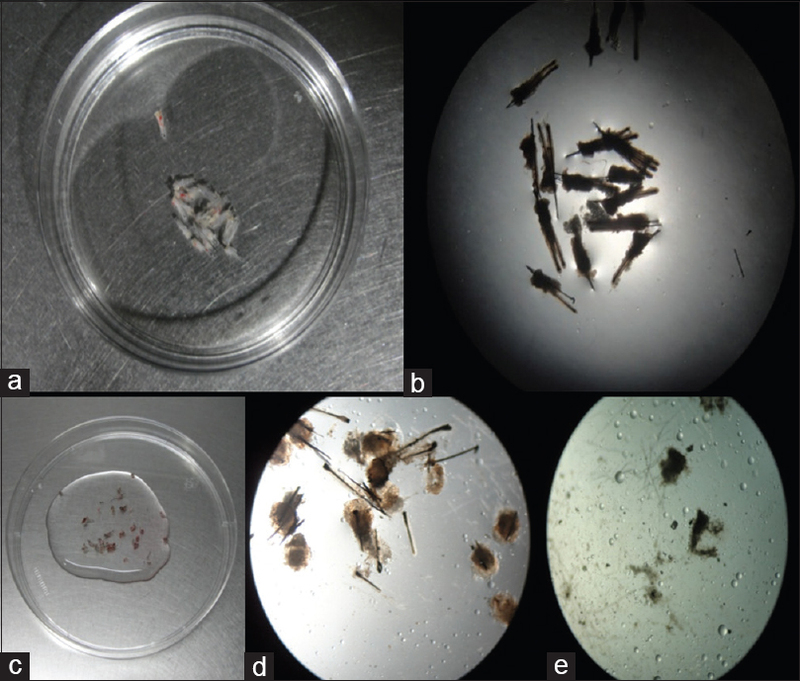 The hair shafts were also examined clinically and with light microscopy. Results: No significant differences were seen between the test and control groups with regard to normal clinical examination and light microscopy findings. 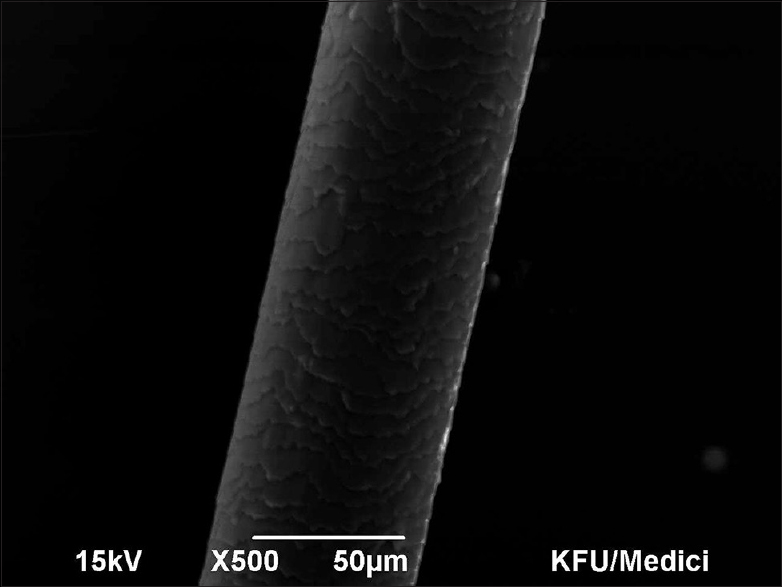 A higher degree of hair shaft damage was evident under SEM in the study group as compared to the control group. This difference was statistically significant. Conclusions: Regular use of procedures such as bleaching, dyeing, or straightening can lead to subtle changes in the hair shaft which can be detected early by SEM.